Further, on Shugden community websites, many deceptions and unsubstantiated claims are made. Investigation of those reveals that things have not changed since Amnesty International and the Indian High Courts made their determinations. There is NOT “overwhelming evidence” of religious persecution. In fact, there is a compelling lack of credible, substantial evidence backing any of the protesters’ claims of serious persecution, no Indian media reports, police reports or impartial reports of any kind. An investigation of the ISC website has so far revealed 32 deceptive statements and 16 unsubstantiated claims. There are definitely more because the investigation is not complete. Some of the deceptions are quite glaring. Some are simply little pieces that accumulate and add up to much bigger and more alarming accusations. In some cases the ISC will go out of their way to deceive. Many of the claims of persecution are in reference to events that took place ten or twenty years ago and that allegedly occurred in hard to reach, restricted areas of India. These claims are extremely difficult to substantiate or verify. Despite that fact, clear deceptions can nonetheless be found, due to simple carelessness in their reporting. When statements from the Dalai Lama appear in their video reports, these are short, misleading snippets taken totally out of context. Many of the protesters’ claims are hearsay and personal interviews. Several of those have been shown to be deceitful. Others cannot be verified. As a direct result of this so-called referendum 900 innocent monks were then summarily expelled from their monasteries. Most of these 900 monks were very poor and had no other place to live; many were fearful of the future and actually wept as they were forced to leave. Screenshot from the International Shugden Community’s (ICS) YouTube Channel (08/23/14) run by Gen Kelsang Rabten, the New Kadampa Tradition (NKT) National Spiritual Director for New Zealand and Australia, currently residing in Hong Kong as the Resident Teacher of the NKT’s “Kadampa Meditation Centre Hong Kong”. ICS is a front group of the NKT. Is the Dalai Lama False? The truth from mainstream historical evidence is that the Dalai Lama was born into a village that had been taken over by a Chinese (Muslim) warlord. There were a few Muslim families in this village, but the majority was Buddhist. The Dalai Lama’s family was clearly Buddhist. In fact, his older brother had been recognized as a high incarnate Buddhist lama years before the Dalai Lama’s birth. Of course, there is absolutely nothing wrong with being Muslim—unless one is claiming to be a Buddhist monk! The Shugden community claims that the Dalai Lama is deceiving the world by not revealing his secret Muslim identity. They hold up banners in their protests showing the Dalai Lama in a Muslim taqiyah (which he donned during one of his many interfaith events). This has caused some to wonder if they are trying to incite Islamaphobia? This is also the reason protesters hold up placards calling the Dalai Lama false, why they chant over and over, “False Dalai Lama, stop lying…” This is entirely based on a wild report from a group of anonymous authors citing another anonymous author! Is the Dalai Lama Lying? The Shugden community changes its mind frequently about why they believe he is lying. There are four full videos purporting to explain why the Dalai Lama is lying on the ISC website. All of those videos contain deceptions themselves. The Dalai Lama then paused and proceeded to address the accusation of lying, whereupon the protester continued to shout “stop lying, stop lying Dalai Lama…” until he was led out by security. 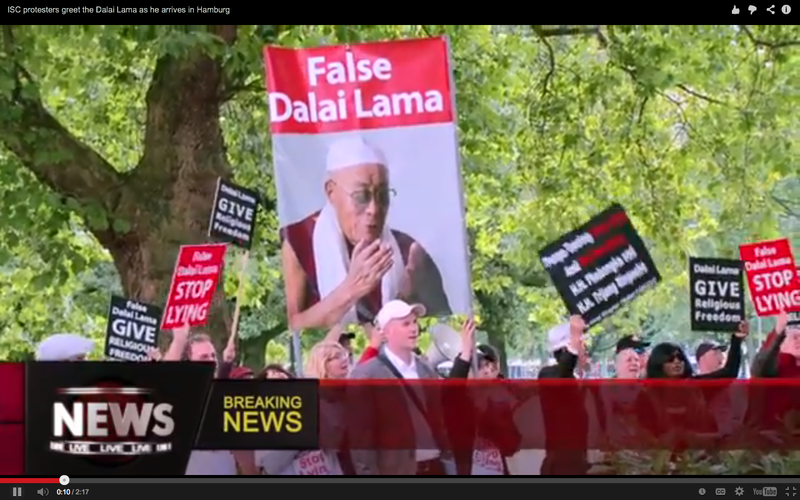 “The False Dalai Lama … evades the question by saying that Buddhist monks don’t lie! In other videos, the ISC claim that that Dalai Lama is lying because he says that he has never “banned” Shugden practice—because he claims that Shugden practice is harmful to the Tibetan cause and his own life…. Because he has disagreed with his teacher over his decision. Certainly the accusation of lying looks good on a placard and can rally the troops to protest, but in fact, the claims can be better described as disagreements over a complex issue, disagreements that are beyond the scope of this pamphlet, or any secular discussion, to address. Statements such as these, which abound in ISC publications and video releases, make one wonder about the purpose and validity of the protests. They wish to portray a sane, reasonable face to the world, a calm complaint of religious persecution and human rights violations—but in fact, carry out an agenda themselves that is dishonest, inflammatory and extremist. Thank you! You have managed to condense the information a few important points while demonstrating a pattern of dishonesty and exaggeration by the ISC. This is exactly the kind of effort that will help people not so familiar with the issue see through the NKT/ISC’s deceptive campaign. The Dalai Lama doesn’t control the government of India. Yes, thanks, no name, in my effort to be brief and to the point, I think I got a little tangled in the words. Tenzin, I will rewrite the statement tomorrow when I have time. The list is the one made by the TGE in 1998– the murder was the one that occurred in the 70s I believe, so it’s closer to 20 years before. I will rewrite it more specifically. Also, could you add that same link to the point directly following the point about the murder? Thanks! Rabten says they are “investigating the tibetan government’s wanted list of Shugden Protesters” (recently put up earlier this year): He is interviewing two Tibetans who are on the current list. Gungtan Tsultrim was murdered in 1976. Later in the video they become more specific about a list that was made in 1997 by the TGE. This is clearly in reference to the internal list made by the TGE following the murder of three monks in MacLeod Ganj– a list that was later leaked. No other list has been made. So my ten years needs to be changed to 21 years and I need to allow for the possibility of a nonexistent third list– which would have nothing to do with Shugden worshippers! My apologies for the sloppiness. I have to say that investigating this stuff makes my head feel a little sick sometimes– the deception is insidious, twisted and pervasive. Thank you very much. I added the changes. Please let me know if everything is correct or if you wish further changes. The claim that “the Dalai Lama tried to unite all four schools of Tibetan Buddhism under him” has no fact in reality and is a myth mainly and foremost spread by Shugden people. It is ridiculous to even think he had, there is no way that this could realistically happen or aimed for. Good call, it is important to make sure the videos are preserved for “posterity”. No, no name, the video has not been removed. It would be really helpful to list the exact point at which these various allegations are made so people dont have to trawl through this excrement-its sickening! No name, that he’s no Shugden devotee, as implied, is another deception they employ. The whole point of the video is to charge followers up about the current CTA list, so they bring in all these unrelated facts as if they are related. The deception is insidious in such ways as these. And Tenzin, you’re right, the entire 13 settlement spin being a conspiracy by the TGE and the fact even that this person was murdered by a TGE representative has no credible backing whatsoever. That is quick– we expected the removal of videos– and in fact the removal is a good thing, showing that maybe they can start being accountable for their statements? I think you guys make everything too complicated.